The event is entirely open, and is not restricted to citizens of either part of the town. Whether you are from Alyth, Ankara or Auckland you may join in on either side, and be able to say truthfully that you have taken part in a Scottish Highland Games. (a) Team to consist of five or eight members and one coach. (b) Raised heels up to a maximum of 1⁄4 inch (7mm) allowed on footwear, and footwear to be inspected prior to start of competition. (c) Overall pull to be 12 feet and winner of each tie to be decided by best of three pulls. (d) No hand over hand pulling allowed. Team members must go back with rope when pulling. (e) Anchorman to loop rope round one shoulder to secure rope as per style used at present. No knot is permitted on the rope end. (f) All team members to remain on their feet at all times. No hands are allowed on the ground apart from the anchorman who is permitted to use one hand on the ground. (g) Draw for ties to take place prior to start of competition. Succeeding rounds to be redrawn at judges discretion. (h) Teams through coaches will be reminded of the rules prior to the commencement of the competition. Only coaches consult with the judge and judges decision is final. 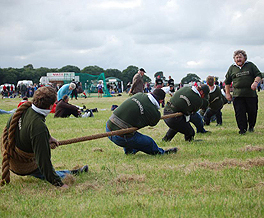 (i) A team member is permitted to pull for only one team during a competition. (j) Judge to toss coin to determine direction of pull. (k) Prior to commencement of pull, judge will ask coaches if they area ready, then give the command ‘take the strain’, at this point team members may heel in, when teams are balanced, order to ‘pull’, is given and the tie has commenced. (l) In weight restricted competitions competitors must be weighted with boots on. (m) Teams will leave the area of competition during ties in which they are not involved. (n) Two warnings for infringements including foul language will be given. A further warning will result in disqualification and forfeit of points awarded for attending competition.